Audi has released a plethora of new beautiful photographs of the Audi TT RS Coupe and Roadster, and it just makes us want them to change their mind about bringing the car to the United States even more. After all, what's not to love? The 2.5-liter turbocharged five-cylinder puts out 340 horsepower and 332 lb-ft torque running through a six-speed manual transmission and Audi's quattro all-wheel drive system. It also comes with other goodies like a stiffer suspension, five-spoke 18-inch wheels, more aggressive exterior styling, Alcantara /leather sports seats, and more. Why wouldn't we want a TT that has all that? More details on the car can be found in the press release after the jump, and dozens of new high-res images are available in the gallery below. Autoblog visited the official unveiling of Forza Motorsport 3, Microsoft's latest racing title for the XBox, at the E3 expo. With graphics playing on numerous flat screens that, to borrow the phrase, moved the game on, and with the backing of an Audi partnership and a gleaming red R8 V10 on a plinth among the crowd, everyone involved was bullish enough on FM3 to make an actual bull think "Better watch out for those guys..." In fact, said Dan Greenwalt, the lead developer at Microsoft's Turn 10 Studios, said "We already made the best racing game the last time, with Forza Motorsport 2." 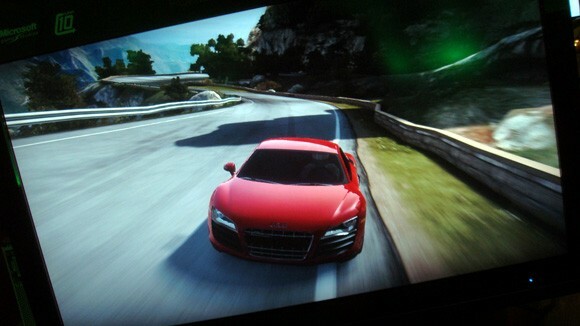 Forza Motorsport 3, he said, signaled that "We were out to make the best game." Follow the jump for the story. The history of the notorious Silver Arrow racers parallels that of the nation which bore its birth. In the years leading up to WWII, Adolf Hitler was bent on world conquest - not just on the battlefield, but on the race track as well. Convinced that motor racing was the perfect venue to exhibit what he viewed as Germany's superiority, the Fuhrer commissioned Germany's top engineers at both Mercedes-Benz and Auto Union to develop a generation of advanced racing machines that would later become known as the Silver Arrows. 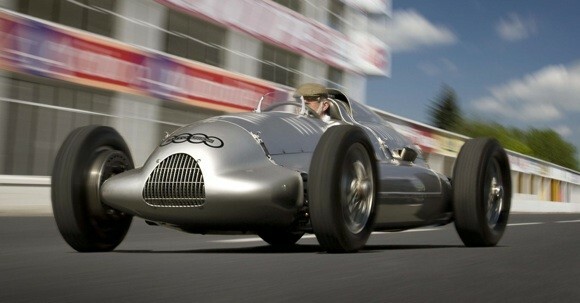 The 1938 Auto Union D-Type was Hitler's favorite. The cars reigned victorious in the 1930s, but with the outbreak of the war, racing in Europe ground to a halt. The following decade Nazi Germany lay in ruins, Hitler was dead, and the Soviets seized the D-Types from the Auto Union factory in East Germany. With an Iron Curtain cutting off contact between the Soviet Bloc and the Western world, enthusiasts and historians were convinced the Silver Arrows remained intact somewhere in the Communist empire, but all the while they were being brutally dismantled. Although many of the Mercedes pre-war racers survived, few of the Auto Unions did. Only three of these D-Types are known to remain intact. The example you see here, Chassis 19, was painstakingly restored to original condition, and was set to hit the auction block at Christie's two years ago until it was withdrawn at the last minute due to unanswered questions over its heritage and provenance. With the questions answered and its pedigree assured, Bonhams is now offering this extremely rare and most desirable piece of automotive history at its upcoming auction at the Quail Lodge this coming August, where it is expected to fetch in excess of $8 million. But with previous estimates having placed it closer to $12 million, it stands a real chance of breaking the $12.2 million record set by the 1957 Ferrari 250 Testarossa at the RM Auction in Maranello just last month. Check out the press release after the jump and the high-res pictures in the gallery below.